In light of our previous blog post on the psychological impact of cosmetic surgery, it was with interest that we saw South American Luis Padron from the Argentinean capital Buenos Ares appearing on UK breakfast TV to show off his cosmetic surgery transformation. Padron claimed to have suffered at the hands of bullies whilst at school, and found sanctuary reading fantasy books and watching fantasy films. Such was his love for the genre; he decided to begin adjusting his appearance so that he had more ‘elf-like’ features. Padron’s quest to have more elfin features has seen him have operations on his jaw, ears, face and eyes – some of which have been major operations. On one occasion he talks about having his jaw broken to adjust the overall shape of his face. He has also had his skin bleached and has altered the colour of his eyes. These operations have left his appearance dramatically altered, with a striking resemblance to fantasy characters we may see in books and films, but it has also left him with a complex routine to maintain these unusual looks. He claims to spend thousands of pounds per month “applying specialist creams, dyes, treatment and SPF 100 sunscreen”. 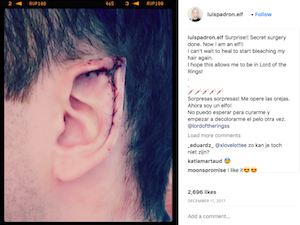 Escaping into a fantasy world was important to Luis Padron, and cosmetic surgery has helped him achieve the look that he has chosen. Whereas the news will always report the headline-grabbing stories like this, it is important to remember that most explorations into the world of cosmetic surgery are done in a more considered manner. Complete transformations like this are very much the exception, not the norm. Furthermore, a responsible cosmetic surgeon would not agree to perform these procedures. Most people will take cosmetic surgery one step at a time; with a considered approach, realistic expectations and a detailed consultation phase with their chosen cosmetic surgeon. If a surgeon is at all worried about a patient’s motivations (such as a desire to look completely different, or adjust their features beyond the realms of what is typically classed as ‘normal’) then this will be discussed at length with the individual to make sure that they are embarking on their cosmetic surgery journey in the correct frame of mind, with appropriate expectations of the eventual outcomes.